This study will collect prospective, observational data on a large number of patients across Europe. A preplanned validation process will verify case ascertainment and data accuracy. The study uses the UK National Research Collaborative model to capture high-quality data while minimising the burden on participating centres. Unlike previous studies, the clinical risk scores will be validated against a prospective cohort of patients presenting with undifferentiated right iliac fossa pain rather than patients who have undergone appendicectomy. Within the remit of this observational study, it will not be possible to track patient readmissions to centres other than the index admitting hospital or readmission rates beyond 30 days. This protocol is designed to be carried out alongside routine clinical practice. This limits the quantity and complexity of data it is feasible to collect. Specific data regarding antibiotic therapy for RIF pain and presenting symptoms outside of those included within risk scores will not be collected. The primary aim of this study is to determine the negative appendicectomy rate. The secondary aims of this study are to determine the rate of laparoscopy for appendicectomy and to validate the AIRS and Alvarado scores for acute appendicitis. A centre survey will profile local policy and service delivery for management of patients presenting with RIF pain. Any hospital that offers acute general surgical services will be eligible to participate. Local collaborators at each centre will prospectively collect data during 2-week long study periods, on consecutive patients referred to the general or paediatric surgery units with RIF pain or suspected appendicitis. Each centre will be able to submit data from up to four study periods between February and August 2017. Patients will be identified prospectively via hospital computer systems, handover lists and by the clinical surgical team. 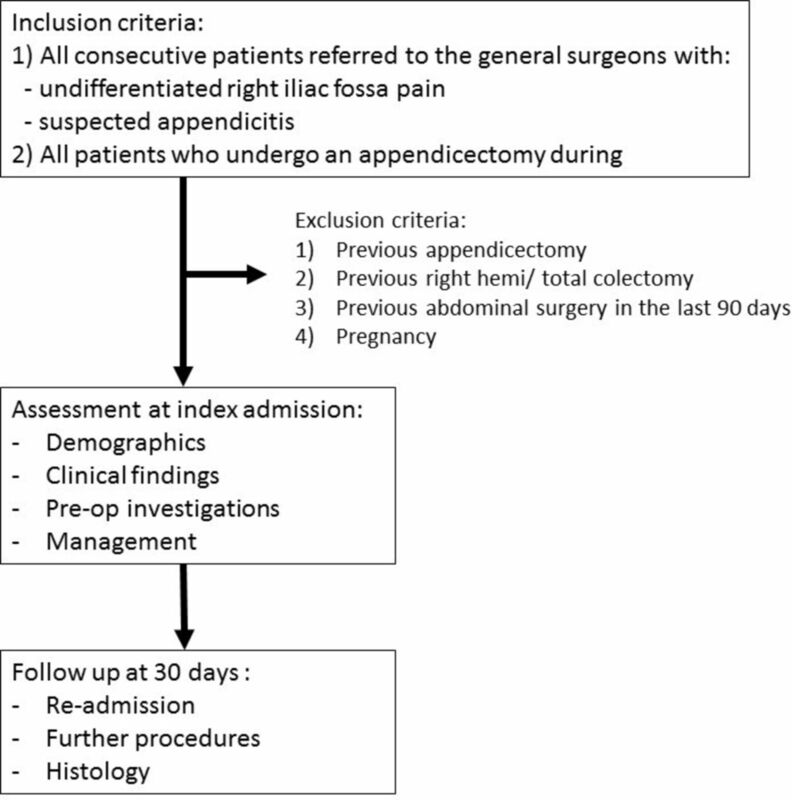 Patients who are pregnant have had abdominal surgery in the preceding 90 days, or have had previous appendicectomy, right hemicolectomy or total colectomy will be excluded (figure 1). Variables required to calculate the AIRS and Alvarado scores will be collected at time of presentation to the surgical unit. Patients will be followed throughout their admission to determine their treatment pathway and length of stay. Data will also be collected on histology and readmission rates, for both the operated and non-operated groups, within 30 days. Collaborators will access electronic records, emergency department and theatre systems and patient notes to collect data. The group who undergo an operation will be followed up to determine the negative appendicectomy rate, and the non-operative group will be followed up to allow for the validation of the AIR and Alvarado scores low risk prediction for this group. The non-operative group will also include those patients diagnosed as simple appendicitis and treated non-operatively and will require follow-up to assess whether they then require a subsequent operation. No patient identifiable information will be collected. A consultant surgeon at each participating centre will complete a short questionnaire regarding the guidelines, protocols and resources available for the investigation and management of RIF pain in their hospital (table 2). The RIFT steering committee (see online supplementary appendix 1) will be responsible for protocol development, data collection and data analysis. A structured system of national, regional and local leadership has been created to coordinate the RIFT study. National leads will oversee participation in RIFT within their countries through networks including the West Midlands Research Collaborative, UK National Surgical Research Collaborative and Italian Surgical Research Group, as well as through social media platforms.13 Regional leads will recruit, advise and ensure the correct approvals are in place for each hospital within their region. Local leads will oversee data collection in their hospital, ensuring adherence to local governance protocols and continuous data collection across the 2-week periods. Up to three collaborators per 2-week period, per hospital, will be recruited to participate. A secure server running the ‘Research Electronic Data Capture’ (REDCap, Boston, Massachusetts) web application hosted by the University of Birmingham, UK, will be used to collect and securely store data. Based on pilot studies across four centres, we estimate that each centre will capture approximately 10 patients with RIF pain per week. The steering committee has received expressions of interest in participation from over 150 centres. It is estimated that around 75 centres will participate during each period. This would result in approximately 6000 patients being included in RIFT across the four data collection periods. It is anticipated that around 20% (1200 patients) will undergo appendicectomy. Data will be reported in accordance with Strengthening The Reporting of Observational studies in Epidemiology guidelines for observational studies.14 Differences between patient, disease and operative specific factors will be tested using Student’s t-test for continuous data (p value) and χ2 for categorical data (reported as χ2, p value). A p-value of 0.05 will be accepted as significant. Preplanned analyses will include and are not limited to: (1) variation in the negative appendicectomy and laparoscopy rates across participating centres and countries and (2) predictive value of AIR and Alvarado risk scores. Sensitivity, specificity, positive predictive value and negative predictive value will be calculated for clinical risk scores. A panelled multilevel, multivariate, binary logistic regression model, including centre as a random effect, will be used to assess the association of clinical risk scores with negative appendicectomy. The model fit will be tested with area under the curve analysis, using Somer’s test to derive a C-statistic. In the UK the online National Research Ethics Service decision tool (http://www.hra-decisiontools.org.uk) confirmed that RIFT does not require research ethics approval in the UK. The RIFT study will be registered as a clinical audit in each participating UK centre. National leads in other countries will oversee appropriate registration and study approval, which may include completing full ethical review. Local investigators will be responsible for ensuring local approvals are in place and will be required to demonstrate this to gain access to the online data collection tool. A consultant surgeon will facilitate presentation of local study results at a governance meeting at each participating centre. Peer-reviewed publications will be published under corporate authorship including ‘RIFT Study Group’ and ‘West Midlands Research Collaborative’. The RIFT study will be a large, multicentre, international, prospective observational study of undifferentiated patients presenting with RIF pain and suspected appendicitis. By using a protocol driven, preplanned data collection tool and analysis plan, this study will ensure high data quality while minimising the burden on participating centres. The 2012 national appendicectomy audit found a significant variation in management of appendicitis across the UK.7 In light of recent guidelines stipulating that appendicectomy in adults should be performed laparoscopically unless contraindicated,9 10 the RIFT study offers the opportunity to examine health system-level quality improvement in the delivery of laparoscopic appendicectomy 5 years on from the 2012 study. By mapping real-life patient pathways for investigation and management of RIF pain, RIFT will indicate whether any increased use of modern technologies, including CT scanning and laparoscopy, have been associated with a decrease in the rate of negative appendicectomy. Validation of the AIR and Alvarado scores in a large international cohort will determine the suitability of using these to stratify patients in to low, medium and high-risk groups for appendicitis, as envisaged by recent guidelines.9 If these risk scores are found to have poor prognostic properties, it may be possible to develop and validate a new score based on the RIFT dataset. Risk scores may aid junior clinicians’ decision-making and may have a role in avoiding unnecessary operations, reducing the negative appendicectomy rate and improving patient safety.5 Furthermore, validated risk scores may be particularly useful in low resource settings with limited access to diagnostic investigations. The UK National Surgical Research Collaborative’s member groups have run trainee-led collaborative studies across 99% of the UK’s surgical units,12 delivering large, prospective studies.7 However, as trainees complete their training and become consultants, the sustainability of postgraduate trainee research collaboratives will be dependent on engaging new junior trainees each year. Whereas previous studies undertaken by surgical research collaboratives have been targeted at either senior trainees or medical students, RIFT is the first study aimed at junior specialty trainees (recent graduates). A surrogate marker for the success of RIFT will therefore be successful engagement and mentoring of junior trainees in collaborative research. The RIFT Study Group has made specific efforts to minimise the risk of inherent bias in this observational study. Data will be collected prospectively and patient pathways followed proactively by collaborators, who will often be the frontline clinicians responsible for the patients’ care. Unlike most previous studies which have focused specifically on patients who undergo appendicectomy, RIFT will include all patients presenting with RIF pain or suspected appendicitis, to general surgical services. Nonetheless, since these patients will have already been triaged by emergency department or general practice doctors, this is likely to be a selected group who are more likely to have appendicitis than patients with truly undifferentiated presentations. Given the large volume of patients presenting with RIF pain and the short inpatient stays that most patients have reliably identifying all eligible patients will be more challenging than in previous studies run by trainee collaboratives. However, preplanned validation by an independent investigator will ensure that case ascertainment rates are monitored. This will also mitigate any risk of reporting bias from clinicians declining to submit details of patients that have been misdiagnosed at their centre. *Due to the pragmatic ‘snap-shot’ nature of this study, carried out by practising clinicians, there is a limit to the depth and breadth of data points included. For instance, the study will not collect the length and nature of perioperative antibiotic treatment (table 1). Furthermore, follow-up is limited to 30 days after the index hospital admission. It is possible that a proportion of patients initially discharged having not undergone appendicectomy may subsequently be readmitted and undergo surgery either at other hospitals or beyond the 30-day follow-up. In summary, the RIFT study is a protocol-driven, international, multicentre prospective observational study using a ‘snap-shot’ methodology, in line with the UK surgical research collaborative model. The study aims to describe the current variation in investigation and management of right iliac fossa pain in several European countries, aligned to contemporaneous specialty guidelines. Royal College of Surgeons and Association of Surgeons of Great Britain and Ireland. Commissioning guide 2014: emergency general surgery (acute abdominal pain). London, 2014. https://www.rcseng.ac.uk/-/media/./commissioning-guide-egs-published-v3.pdf (accessed on 1 Jan 2017). National Surgical Research Collaborative. Multicentre observational study of performance variation in provision and outcome of emergency appendicectomy. Br J Surg 2013;100:1240–52.
. On behalf of the National Surgical Research Collaborative). The impact of research collaboratives in the UK. Lancet Gastroenterology & Hepatology 2017;2:247–8.